The collision of the tour bus and pickup truck killed at least eight people in Southern California highway near the town of Forest Falls. 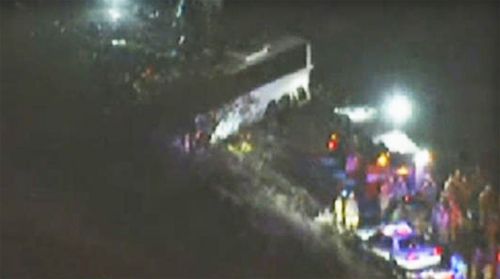 The total estimated injured was around 38 people, the tour bus collided to the another vehicle in Mentone. California Highway Patrol spokesman Mario Lopez said, "at least eight have died from the Sunday night crash," he added, "38 injured people were taken to hospitals." The Department of Transportation spokeswoman Michelle Profant said, "It's pretty ugly up there with body parts." The bus was heading back to Mexico from Big Bear, afterwards the incident occurred around 6:35 p.m., according to report by CBS News site. According to report by KCAL9's Andrea Fujii, there are 39 people inside the tour bus and four persons in the pickup truck. Meanwhile, the cause of the crash accident was still under investigation but the preliminary observation believed the bus driver lost the bus control, flipped and fell on the pick-up truck. Comments or suggestions about "8-people killed in California tour bus crash" is important to us, you may share it by using the comment box below.